The SHE Coaches Program is a unique program developed by SHE Investments, Inta Sellick and Barbara Anderson, professional international coaches from Australia. This program offers trained coaches the opportunity to use their skills in a different culture and environment, volunteering their services for women who would otherwise not have the chance to benefit from them. This program offers a shared learning experience for both female Coaches and Cambodian women who manage micro, small and medium sized enterprises. By participating in this program, and contributing to SHE’s work, Coaches make it possible for women in Cambodia to access ongoing training and mentoring to support them to scale their businesses and create impact for communities. SHE is creating a network of Cambodian women in business, so they can learn from and support each other. Coaching and mentoring is an important aspect of our program, in which we connect our entrepreneurs with successful Cambodian businesswomen so they can learn from them and receive mentoring and advice. 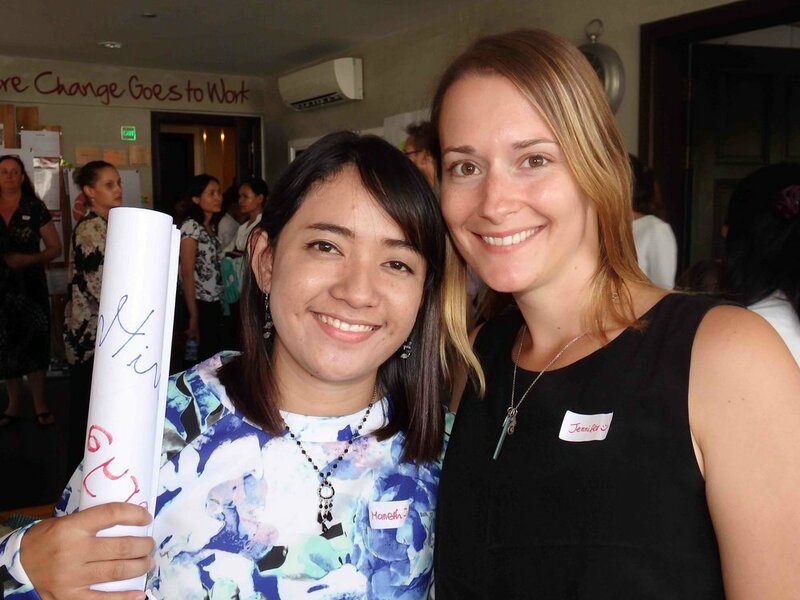 Inviting professional Coaches from Australia or other countries to mentor and train SHE’s facilitators, mentors and participants in coaching techniques is extremely valuable for both our team and the impact they will continue to make for women in Cambodia. Building local capacity is crucial in passing these skills on to Cambodians who will continue to use them long after the SHE Coaches Program ends. Finally, we are passionate about providing coaches with a unique opportunity to develop their skills and enhance their experience by providing a program that is mutually valuable for both coaches and Cambodian female entrepreneurs. You’ll spend 3 days in peaceful Kampot, receiving world-class Coaching training amongst beautiful natural scenery and alongside the Mekong River. Take the next step in your Coaching career by receiving your next certification and learning from some of the world's best. You'll also receive training in cross-cultural coaching, spend time reconnecting to your "Why", and explore the beautiful Kampot countryside. You’ll travel to Phnom Penh and participate in cultural and historical activities. You’ll learn about the barriers that women face in life and in business firsthand, and gain new insight into Khmer culture. 3) Put your coaching skills to use! You’ll meet the SHE team and begin to practice what you’re best at, using the learnings and insights into Cambodian culture that you’ve learned over the past few days. You'll visit women's businesses and participate in a full-day coaching event, providing 1:1 coaching to multiple women over 2 days. You will leave Phnom Penh with a full heart, new friends, and new skills! March 22nd: Fly in to Phnom Penh, be picked up from the airport and delivered to your hotel. March 23rd: Welcome to Cambodia! Today you will have a Welcome Ceremony, Orientation, and a traditional Buddhist Water Blessing to wish you good luck and welcome you to the Kingdom of Cambodia. March 24th: Travel to the beautiful province of Kampot to participate in Coaching Workshops (20 CCEU's). March 25th: Finish your coaching workshops, and visit a female-owned ethical and sustainable garment factory to learn about the challenges facing entrepreneurs in Cambodia. March 26th: Travel to Phnom Penh and learn about Cambodia's recent challenging history by visiting the Killing Fields. March 28th: The SHE Coaching Event! Spend a full day providing multiple coaching sessions to women from a variety of industries and backgrounds. Learn about the challenges they're facing and coach them to find solutions and set actions to move forwards. March 29th: Final coaching session, shopping and sight seeing, and farewell dinner. Inta is an experienced professional coach credentialed with the International Coach Federation as a Professional Certified Coach (PCC). She is Principal, Coach Consultant of her own business working across Australasia as an executive and leadership coach and in developing coaching cultures in organisatiions. Her strong commitment to developing the profession of coaching and its growth is demonstrated through her leadership roles with the International Coach Federation Australasia. Inta’s experience as a coach spans 15 years and almost 20 years as a facilitator. At the heart of her purpose is her wholehearted commitment and passion to contribute locally and globally by working with people leading in their lives beyond themselves and developing emerging leaders. Barbara Anderson is a Master Certified Coach with the International Coach Federation, with more than 20 years experience working with a range of corporate and small business clients as a Trainer, Consultant, Facilitator, Mentor and Coach for their Business and Personal Development. Barbara has a passion for Coaching and Leadership and has trained hundreds of new coaches and managers in coaching skills. She has been on the International Coach Federation Australia (ICFA) board as Director Professional Standards, and in December 2008 was awarded “Australasian Coach of the Year” by the International Coach Federation. Barbara has a significant international reputation, including being involved with the growth of coaching in India, China & Thailand over the past few years. Barbara was on the EXCO and is a member of the Asia Pacific Alliance of Coaches. Celia is the Co-Founder and Managing Director of SHE Investments. She has a Masters of Community and International Development, and has managed projects across Kenya, regional Australia, Papua New Guinea and Cambodia. Celia has also started two businesses herself, and is passionate about women's economic empowerment and the power of business to create impact. Celia was named as one of 18 Young Social Pioneers in Australia in 2014 by the Foundation for Young Australians, and in 2017 she was named as an Emerging Leader in the Australia-ASEAN region by the Prime Minister's Cabinet of Australia, AsiaLink, and the Australia-ASEAN Council. Lida is the Co-Founder and Programs Manager of SHE Investments. She is a passionate young leader in Cambodia, driven to create change for young people and women so they can contribute to Cambodia's economic development. Lida is one of the leading facilitators in Cambodia, and has trained and mentored more than 60 micro-small enterprises through SHE's programs. In 2017, she was named as a Young South-East Asia Leader (YSEALI) by the U.S. State Department, and represented both SHE and Cambodia part of the YSEALI program to America. Please note that this program fee is not a tax-deductible donation. To make a tax-deductible donation to SHE, please contact us to find out how. This is separate to your Coaches Program fee.